Founders Peter and Sharon Blomquist established the first Patio Town Store in 1965 in North St. Paul, Minnesota. The store later relocated a short distance to Oakdale, Minnesota. It was the first retail business in the Twin Cities that sold rock, pavers and retaining walls to homeowners. It quickly established itself as the premier retail outlet for landscaping supplies and hard goods. In 1975, a second Patio Town store opened in Burnsville, Minnesota, and a third location opened in Maple Grove, Minnesota, in 2001. Today, the three Patio Town stores are the Twin Cities' exclusive outlets for VERSA-LOK retaining wall systems, Willow Creek paving stones and Handy-Stone products. The stores serve both homeowners and, through their adjacent contractor sales yards, landscaping professionals. Each store carries more than 30 kinds of decorative rock and natural stone, along with landscaping accessories, outdoor furniture and yard and garden décor. The friendly, knowledgeable staff, walkthrough outdoor displays, and free installation seminars provide customers with a pleasant alternative to big-box home improvement chains. ShopPatioTown.com brings the Patio Town experience to the online world, with an expanded selection of art and décor for yard and garden, a selection of landscaping accessories and an assortment of other quality products, including fire and water features, to enrich and enliven your outdoor living. Products ship anywhere in the continental United States. 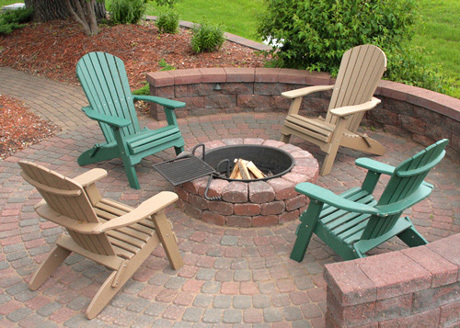 Let Patio Town help you turn your yard into the Great Outdoors. Shop conveniently online or visit our stores in person. You're sure to find that perfect addition to your yard or garden. Questions? Email us at sales@shop-patiotown.com .